Gorkha Janmukti Morcha chief Bimal Gurung today asserted the political outfit floated on Wednesday by Kalimpong MLA Harka Bahadur Chettri was the brainchild of the chief minister and that it would not last for more than two and a half months. Gurung was speaking here at the Mela ground in Kalimpong at a public meeting, meant to be a show of strength of the Morcha in response to the Jan Andolan Party announced by the Kalimpong MLA yesterday from the same spot. Addressing thousands of people gathered, the GJM chief said, “I am the type of person that has challenged the Bengal chief minister. Presently the ball (the demand for Gorkhaland) is near the goalpost and now what is left is just to score a goal. Bengal thinks they will lose so they have borrowed players (JAP). What are you (Chhetri) expecting from Banerjee that you are so confident? We expect Gorkhaland from Delhi so we are staying there. He who also maintained that the word Gorkha was not in the Chhetri’s party name because the chief minister had not accepted it. Gorkhaland demand,” he said. Commenting on the announcement of the state government of making Kalimpong a district, Gurung said, “Kalimpong cannot be made a district as it has been leased from Bhutan and first the lease should be cancelled and the place incorporated into India. I do not have to make this understood to the state, but the Centre should understand that this is a leasehold land and it should be attached with India.” After the Anglo-Bhutan War in 1864, the Treaty of Sinchula (1865) was signed, in which Bhutanese held territory on the left bank of the Teesta River was ceded to the British East India Company forever. 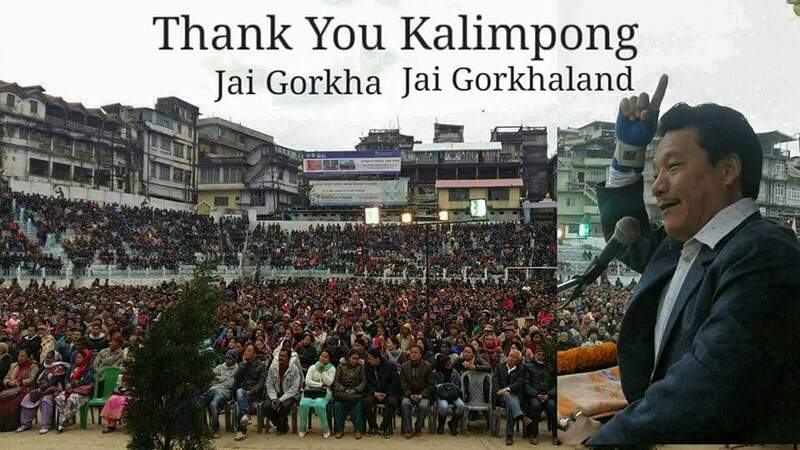 Gorkha Janmukti Morcha chief Bimal Gurung today asserted the political outfit floated on Wednesday by Kalimpong MLA Harka Bahadur Chettri was the brainchild of the chief minister and that it would not last for more than two and a half months.